Arkansas does not use villages or civil townships as possible designations for its minor civil divisions. 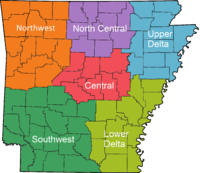 In Arkansas, a municipality may extend into multiple counties. ^ "Arkansas: 2010 Population and Housing Unit Counts 2010 Census of Population and Housing" (PDF). 2010 United States Census. United States Census Bureau. September 2012. p. 18. Retrieved August 23, 2016. ^ "Guidebook for Municipal Officials of Mayor/Council Cities" (PDF). North Little Rock, Arkansas: Arkansas Municipal League. May 2007. p. 6. Archived from the original (PDF) on June 17, 2013. Retrieved August 13, 2012. ^ "MAJOR DIFFERENCES BETWEEN CLASSES OF ARKANSAS MUNICIPALITIES" (PDF). Arkansas Municipal League. Retrieved December 11, 2017. ^ "Geographic Areas Reference Manual" (PDF). United States Census Bureau. November 1994. p. 25. ^ Herndon, Dallas T. (1922). The High Lights of Arkansas History (2nd ed.). [Little Rock]: Arkansas History Commission. pp. 30–33. LCCN 23027121. OCLC 4599910. OL 6659882M – via Internet Archive. ^ Herndon, Dallas T. (1922). The High Lights of Arkansas History (2nd ed.). [Little Rock]: Arkansas History Commission. p. 54. LCCN 23027121. OCLC 4599910. OL 6659882M – via Internet Archive. ^ a b Herndon, Dallas T. (1922). The High Lights of Arkansas History (2nd ed.). [Little Rock]: Arkansas History Commission. pp. 77–78. LCCN 23027121. OCLC 4599910. OL 6659882M – via Internet Archive. ^ Bearden, Russell E. (2017). "Pine Bluff (Jefferson County)". Encyclopedia of Arkansas History & Culture. Central Arkansas Library System. Retrieved May 8, 2017. ^ Dyer, Steven (2017). "Bryant (Saline County)". Encyclopedia of Arkansas History & Culture. Central Arkansas Library System. Retrieved May 8, 2017. ^ Bearden, Russell E. (2017). "White Hall (Jefferson County)". Encyclopedia of Arkansas History & Culture. Central Arkansas Library System. Retrieved May 8, 2017. ^ Teske, Steven (2017). "Redfield (Jefferson County)". Encyclopedia of Arkansas History & Culture. Central Arkansas Library System. Retrieved May 8, 2017. ^ Teske, Steven (2016). "Altheimer (Jefferson County)". Encyclopedia of Arkansas History and Culture. Butler Center for Arkansas Studies at the Central Arkansas Library System. Retrieved May 8, 2017. ^ Teske, Steven (2017). "Rockport (Hot Spring County)". Encyclopedia of Arkansas History & Culture. Central Arkansas Library System. Retrieved May 8, 2017. ^ Teske, Steven (2016). "Humphrey (Arkansas and Jefferson Counties)". Encyclopedia of Arkansas History & Culture. Central Arkansas Library System. Retrieved May 8, 2017. ^ Teske, Steven (2017). "Wabbaseka (Jefferson County)". Encyclopedia of Arkansas History & Culture. Central Arkansas Library System. Retrieved May 8, 2017. ^ Teske, Steven (2017). "Amagon (Jackson County)". Encyclopedia of Arkansas History & Culture. Central Arkansas Library System. Retrieved May 8, 2017. ^ Teske, Steven (2017). "Sherrill (Jefferson County)". Encyclopedia of Arkansas History & Culture. Central Arkansas Library System. Retrieved May 8, 2017. ^ "Blue Eye (Carroll County) - Encyclopedia of Arkansas". www.encyclopediaofarkansas.net. Retrieved December 11, 2018.